I needed a new deer-foot brush (the #2 crease brush in this set), and I first looked at some really high-end brushes. After nearly choking to death on the price tag, I went to go see what was new at Target! I have several Sonia Kashuk brushes, so I knew they would be soft and long-lasting. They were sold out of just the deer-foot brush at my local Target, and then I noticed that this set included one. I felt the brushes they had on display; they are SO soft! The real test is brushing them on your face, but I'm not going to do that with a display brush. This set is currently priced at just under $15, so I went ahead and bought the set. 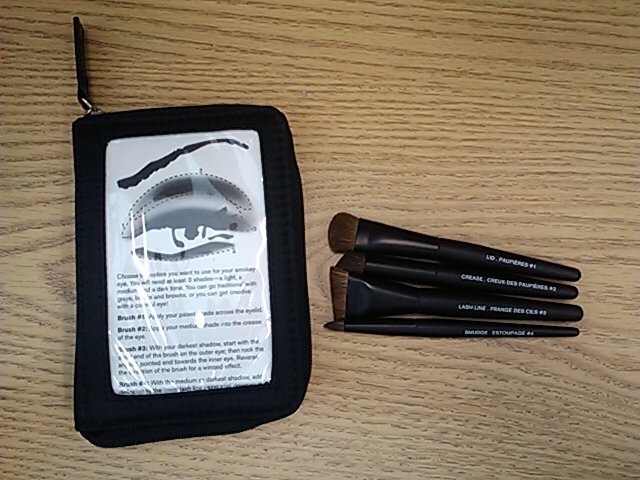 It comes with four brushes, the #1 Lid Brush, #2 Crease Brush, #3 Lash Line, and a #4 Smudge brush. #1 is a wide and shallow domed brush, and is really good at picking up a lot of shadow at once. #2 is the flat-topped angled crease brush (what I call a deer-foot), and I love these brushes for both all-over color application, and for blending. #3 is a smaller version of #2, and is intended for use on the lash line. It does a fine job at that, and I really like it to blend just at the point where colors meet. A bigger brush can blend the colors too much and make things muddy. #4 is the smudge brush, and it will smudge out the entire lash line at once. I'm not sure how I feel about that, yet. It does work, but because it is so big, I think it takes away some of the control over thickness. I really like it for applying contouring powder to my face, though. It is perfect for getting a straight line down the sides of my nose, and for accenting the hollows of my cheeks. The case is decent, but it is certainly not the item you are paying for. 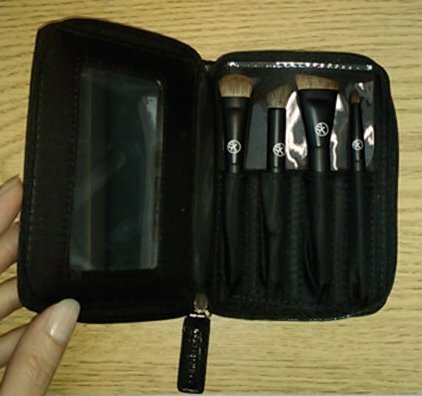 It would be good for travel, but for everyday storage, my brushes are kept loose so they can dry out between uses. Also, note the size of the kit compared to my fingers. These brushes' handles are travel-sized. I prefer a longer handle, but the length of these is long enough for balance and control. I don't mind the size, but if you order these online I don't want you to be surprised at it! Overall, I am very happy with this purchase, as I expected to be. My other Sonia Kashuk brushes have lasted a few years now, and are still holding up well. I expect these to do the same.